A loan of $1,625 helped a member to buy Primus beverages, juice and sugar. Madeleine is a brave, married woman, president of the "Abigael" banque villageoise and a client of IMF Hekima. She has 4 children, all of whom are in education. She sells beverages from her home, situated on a lively city street. She plans to buy Primus beverages, juice and sugar in order to bolster her business. She began her business with the capital she received from her husband 19 years ago. Madeleine wishes to build a house and to educate and feed her children. She ultimately thanks Hekima for the support it has provided for entrepreneurs otherwise without access to bank credit. Translated from French by Kiva volunteer Nicolas Deas. View original language description. Madeleine est une brave femme, présidente de la banque villageoise «Abigael», cliente de l’IMF Hekima, mariée, âgée de 60 ans et mère des 4 enfants qui tous étudient. Elle est vendeuse des boissons au domicile dans une avenue animée de la ville. Elle va acheter les boissons Primus, jus et sucrée pour renforcer ses activités. Elle commença son activité par le capital reçu de son mari depuis 19ans. Elle souhaite construire une maison, scolariser et nourrir ses enfants. Au final, elle remercie Hekima pour le soutien apporté aux entrepreneurs non bancables. It serves entrepreneurs in conflict-affected areas with few opportunities. Hekima is a microfinance institution headquartered in Goma, Democratic Republic of the Congo (DRC), with branch offices in Goma and Bukavu. Hekima aims to contribute to the transformation of the economic, social, and spiritual lives of the economically active poor of the DRC. 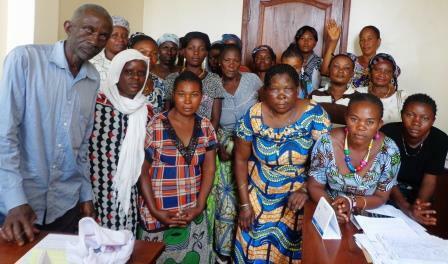 To this end, Hekima provides its clients with solidarity group loans to support income-generating activities. Despite ongoing instability and violence in its operating areas, Hekima continues to keep its doors open and provide credit and savings services for its over 90% female clientele. Hekima is committed to working in one of the world’s most difficult regions wracked by civil war, rebel armies and militias, and internally displaced persons (DRC is estimated to have lost more than 2 million people in the two Congo wars from 1996-2004, of which many have been in the two Kivu provinces in which Hekima works) and works with the economically active but very poor. Hekima works with a large population of internally displaced persons (IDP), for whom access to financial services is often extremely rare. For Kiva, in particular, current and post-conflict environments provide a unique opportunity to leverage the power of the internet lending community for loan capital. Kiva capital provides not only a unique way for Hekima to expand with inexpensive financing but provides visibility and potential connections to other funders in the future.